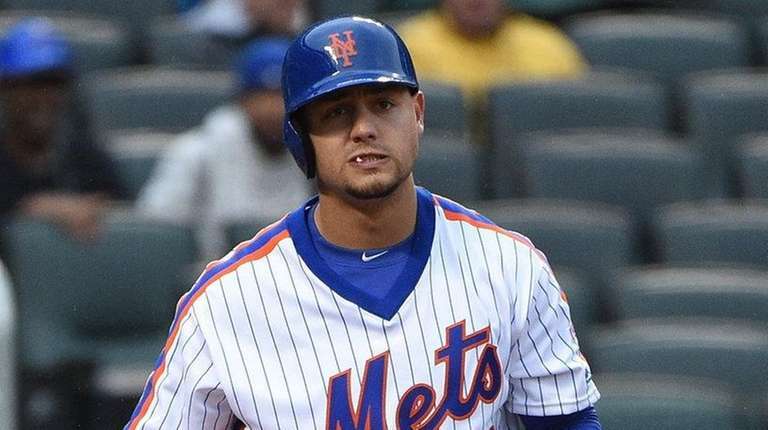 The weather reports painted a gloomy picture, but Michael Conforto spent his Sunday morning hoping for the rain to stay away. His opportunity finally had come. For the Mets’ homegrown hitting star, the final remnant of training wheels has been action against tough lefties. But even with Giants ace Madison Bumgarner on the mound, manager Terry Collins couldn’t resist keeping Conforto’s name on the lineup card. For one day, Conforto got a bitter taste of the torture that Bumgarner has inflicted upon even the most experienced lefthanded hitters. Until Sunday, Conforto had never seen for himself Bumgarner’s tricky cross-body delivery, one that makes baseballs appear as if they’re coming from behind a lefthanded hitter’s back. He had never seen Bumgarner’s command of a slider and fastball that appear almost indistinguishable out of his hand. The results were predictable. In three at-bats against Bumgarner, Conforto struck out twice and flied out. He went 0-for-5 for the day, ending a career-high streak of reaching base in 17 consecutive games. Indeed, it was the kind of day that was bound to happen for the Mets (15-8). For the first time this season, fireballing righty Noah Syndergaard appeared merely human. Not only did he allow four runs in 5 2⁄3 innings, but the Giants punished him on the basepaths, exposing what has been a persistent problem with keeping runners honest. And the Mets watched their season-best eight-game winning streak came to an end. However, on an otherwise forgettable afternoon, the Mets began the important process of learning how their most promising young hitter will handle facing the game’s toughest southpaws. Until Sunday, the only person consistently capable of keeping Conforto off the bases of late has been Collins, who has insisted upon shielding the young talent against lefties. But the manager finally broke from policy. Conforto began the day among the National League leaders in average (.365), on-base percentage (.442) and slugging (.676). So with Bumgarner on the hill, Curtis Granderson wound up on the bench. Conforto, 23, has been a quick study since his arrival in the big leagues last July from Double-A Binghamton. He already has learned to obey a fine line. While he has respected his foes, he’s stopped short of regarding them as deities. Despite the results, Collins acknowledged what Conforto’s exposure to tough lefties could mean in the future. Plenty of tough southpaws will stand between the Mets and their goal of winning the World Series. On an upcoming road trip, the Mets could see one of them in Dodgers star Clayton Kershaw. Before the end of May, they could see another in White Sox ace Chris Sale. Conforto wants a piece of them, too.